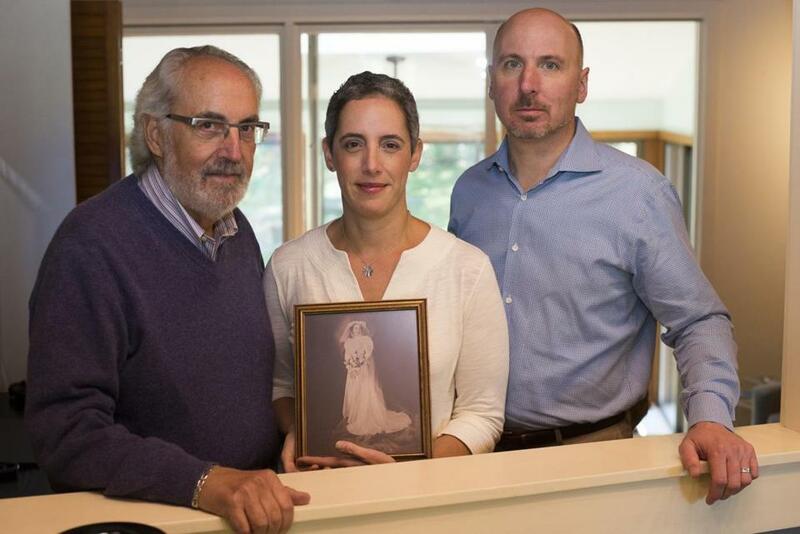 Lauren Corduck with her father, Bob Cooperstein, and her husband, Robb Corduck. Lauren Corduck and her father carry a BRCA gene mutation. Lauren Corduck had been haunted by the fear of breast cancer. Her grandmother died of it at 56, and an aunt had it twice. Corduck had undergone annual mammograms since she was in her 20s. Last December, prodded by a friend, she received genetic counseling. She learned that because she was an Ashkenazi Jew — descended from Central and Eastern European immigrants, as are most American Jews — she had a 1 in 40 chance of having a cancer-linked mutation of the BRCA1 or BRCA2 genes. That’s at least 10 times the odds faced by the general population. If Corduck had the mutation, her odds of eventually getting breast cancer would be as high as 85 percent and of getting ovarian cancer — for which there is no screening available — as high as 55 percent, according to the Massachusetts General Hospital Cancer Center. Given her family history and heritage, Corduck didn’t hesitate to have a blood test to screen for the gene mutations. And given her professional background in nonprofit management, she began thinking about how to alert others to the mutation. After finding that she was far from alone in her ignorance of the prevalence of the mutation, Corduck launched Oneinforty. Its primary mission: informing every Ashkenazi Jew about the BRCA gene mutations and encouraging them to be screened. Oneinforty holds its first symposium on Nov. 9 at Congregation Kerem Shalom in Concord. Experts from leading Boston medical institutions will explain genetic counseling and testing and how it can save lives. For Corduck, the symposium was many harrowing months in the making. Three weeks after being tested last year, the Acton mother of two received the news she had dreaded but expected: She has a BRCA gene mutation. She scheduled a session for January to discuss her health options. But the day of the meeting, the agenda suddenly changed. Coincidentally, at the same time she was waiting for her test results, Corduck was battling severe lower back pain, a condition that had flared up periodically over the nine years since her daughter was born by caesarian section. In the past, chiropractic treatment had always provided relief. Not this time. After several weeks in agony, she persuaded her doctor to order an MRI. The initial results showed nothing out of the ordinary. As she was driving to her January appointment, she received a call from an oncologist who said further review revealed signs of possible malignancy. Corduck went on to the meeting, where instead of discussing how she could ward off cancer, the urgent question was whether she already had it. Within weeks, Corduck discovered that indeed she did. The back pains were a symptom of ovarian cancer that had already spread beyond her abdomen to lymph nodes in her upper body. Between January and May, she underwent six infusions of chemotherapy. Midway through, she had surgery to remove cancerous tissue and her reproductive system. As Corduck recovered — her strength sapped by five-hour chemo sessions that left her feeling like she’d been flattened by a Mack truck and her emotions rocked by anxiety over whether she’d see her children grow up — she mapped plans for Oneinforty. By summer, Corduck already had put up a website and assembled boards of advisers. “I feel so fortunate to have the experience in nonprofit management,” she said, crediting as well the support of her genetic counselor and physicians. “We really try to give people hope,” said Jill Stopfer, who counseled Corduck and is now on Oneinforty’s medical advisory board. “We can push the odds now in their favor . . . reduce their chances of serious illness, reduce their chances of dying from cancer,” said Stopfer, who is associate director of genetic counseling at the Center for Cancer Genetics and Prevention at the Dana-Farber Cancer Institute. Oneinforty advises men and women who have at least one Ashkenazi Jewish grandparent to be tested for the BRCA gene mutations by age 25. While the mutation slightly increases the risk of breast and prostate cancer in men, the most important reason they should be tested is for their children. A parent with the mutation has a 50-50 chance of passing it on. If both parents test negative, their children won’t have to worry about the mutation. What’s next after a positive test depends on the individual. Women with a BRCA gene mutation are advised to begin a protocol at age 25 of having an annual mammogram followed six months later by a breast MRI, which can detect a tumor the size of the head of a pin. Even with the mutation, women rarely develop ovarian cancer before age 40, according to Stopfer. But older women, she said, may want to consider prophylactic surgery. Removal of the ovaries and fallopian tubes markedly reduces the risk of cancer in that area of the body, according to Dr. Whitfield Growdon, who is Corduck’s gynecologic oncologist at Mass. General’s Center for Gynecological Oncology. The procedure, which does not require an overnight hospital stay, can be performed with laparoscopic surgery that involves three or four tiny incisions in the abdomen. The BRCA mutation is present in an estimated 12 percent of women overall who develop ovarian cancer, Growdon said. Survivors with the mutation have a better than average prognosis, he added. Not only do they live longer, but they are particularly receptive to drugs for treating recurrence that have been approved in just the last three years. Unlike traditional chemotherapy, which is administered intravenously and affects the entire body, the new medication comes in pill form and targets just the cells that have the BRCA mutation. “It’s like the tumor has an Achilles’ heel that other cells in the woman’s body don’t have,” Growdon said. Researchers are hoping to develop similar medication to target breast cancer recurrence. The website Oneinforty.org includes a video of Corduck recounting her story and resources about genetic testing and counseling, insurance coverage, cancer risks, and obtaining emotional support. An alternative to the blood test is a home kit that uses saliva, such as that offered by genetic testing companies like Color.com. Oneinforty has three volunteer licensed clinical social workers available to help families before, during, and after testing. Corduck said they field questions such as “Should I even get tested? I’m terrified,” how to discuss a positive diagnosis with family members, and what actions to take. With her cancer now in remission, Corduck has assembled a team of ambassadors to spread the message at synagogues, schools, and community groups. She’s also working with MGH, Dana Farber, Beth Israel Deaconess Medical Center, and nonprofits such as Hadassah, the Jewish women’s group; FORCE (Facing Our Risk of Cancer Empowered); Sharsheret, a Jewish breast cancer organization; and the BRCA Foundation. Hadassah is cosponsoring the free November symposium. To register, visit Oneinforty.org. Among the speakers is Growdon, who was oneof the first members of Oneinforty’s medical advisory board. “We don’t want women like Lauren to harbor sadness and feel like they did this to themselves because they failed to act,” he said. Steve Maas can be reached at stevenmaas@comcast.net.